My meat-eating status can best be described as fragile. Normally an avid omnivore, I occasionally find myself confronted, affronted and appalled by standard factory farming practices. One week, I will be chowing down on hotdogs like nobody's business...and then the next, I am disgusted by mechanical separation, coloured vats of pink paste and all that nice stuff. 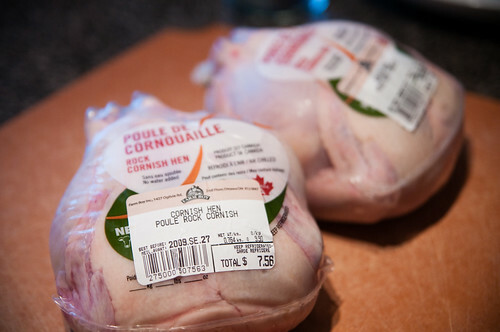 I do generally try to purchase more ethically farmed meat; from local butchers, farmers or boutique grocery stores. I would be lying if I said that this were always a successful venture, but I do try to do my part. 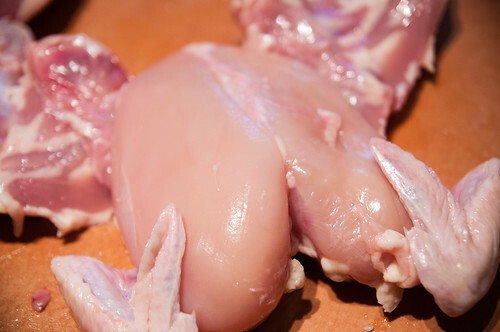 One particular critter that hadn't really entered my radar was the cornish hen. Like oh-so-many people right now, I don't actually deal with a lot of meat that's still on the bone. I tend to find it more labourious, fatty and icky than its boneless, skinless counterpart, so I just don't tend to purchase a lot of bone-in cuts. 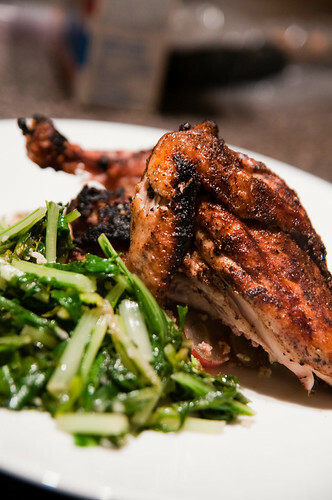 Given the small size of the cornish hen, it's pretty hard for it to enter into boneless territory. But after having tried it again, I have to say, it's worth the extra work and ickiness because it's just SO delicious. It's a bit more flavourful than chicken and it's sooooooo juicy and yummy. I found this recipe in Clean Eating (Sept/Oct edition) and while it's healthy, it's one of the most delicious things I've ever eaten. 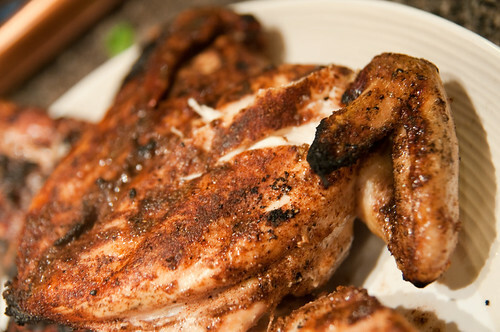 If you're too skeeved to skin and flatten a cornish hen, you could do this with boneless, skinless chicken breast, but it wouldn't be neeeeearly as delicious. So I encourage you to stretch your horizons, gird your loins, and give this a try. Cuz it's so good. 1. (This is the icky part). First, using sturdy kitchen scissors, cut the backbone out of the cornish hen. Flatten the hen (yes, you will hear bones break). Next, remove the skin (it's gross, but not that difficult). I didn't bother skinning the wings because I knew I wouldn't eat them and it was too much effort. 2. 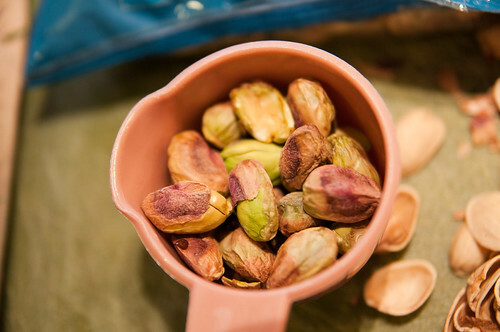 In a small bowl, combine pepper, cinnamon, coriander, ginger, salt and nutmeg. Set aside 1 t spice mixture. Combine remaining spice mixture with the olive oil to make a paste. Rub the paste over the hens, dividing it evenly. 3. I bbq'd my hens. They were flattened on an oiled grill, and weighted down with a heavy cast-iron griddle. If you can't do this, you can bake them at 450F for about 30 minutes. Weighing the hen down is a really effective way to cook it - you could also use a cast iron skillet, or a cookie sheet weighed down with some bricks. It cooks fast and evenly this way. It's soooooooooo yummy. 4. Meanwhile, in a medium saucepan over medium-high heat, bring broth and reserved 1 t spice mixture to a boil. Stir in the couscous, cover and turn off the heat. Set aside for 5 minutes (couscous is so fast and easy! love it!). 5. 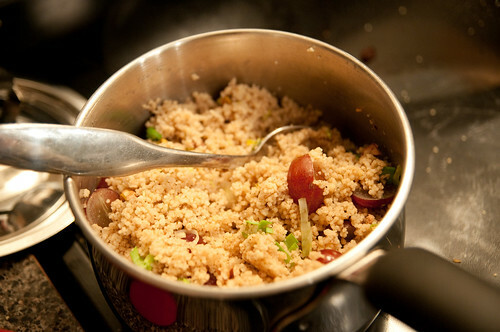 Stir grape, pistachios and green onions into couscous. Transfer couscous to a serving bowl or plates and serve alongside hens. Technically, this will serve 6, but if you're big eaters, count on it serving 3 non-dieting types. It's yummy. The next time I went back to the grocery store after this, cornish hens were on sale, so I picked up a couple for my freezer. Yum! Day 2 down. 28 to go. Thanks for another great recipe. 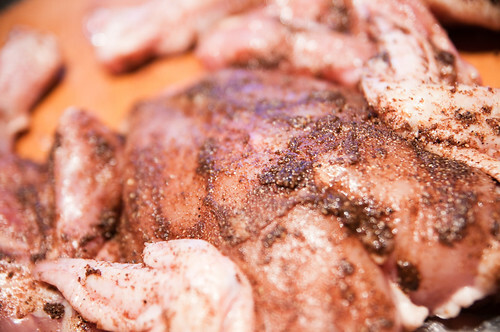 I've always wanted to try cooking cornish hens - and now that I know it's not too hard, I'm totally trying it! nice recipes. it's looks delicious. I really like your blog. I do something similar to this on some nights, using chicken and a Middle Eastern spice mixture I made up. OMG. I made this tonight for my family, and they loved it! It was so good, and they were wowed by the fact that I made something different than regular chicken. I did find 4.5 T of olive oil to be a bit much, the paste was more of a syrup consistency. But it worked just as well, so no real complaints here.